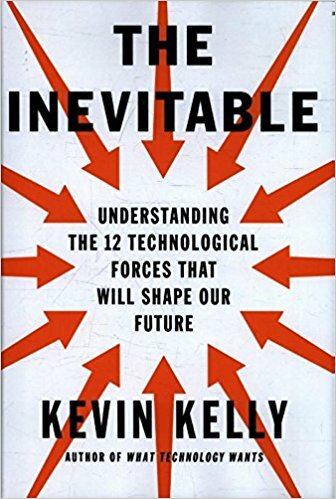 I read The Inevitable by Kevin Kelly and it gave me a lot more perspective on the future and how I can participate in the next big changes the world is going to go through. It is both a practical and conceptual book. Anyone can claim to be a prophet, a fortune-teller, or a futurist, and plenty of people do. What makes Kevin Kelly different is that he's right. In this book, you're swept along by his clear prose and unassailable arguments until it finally hits you: the technological, cultural, and societal changes he's foreseeing really are inevitable. It's like having a crystal ball, only without the risk of shattering. As exhilarating as the most outlandish science fiction novel, but based on very real trends. Kevin Kelly is the perfect tour guide for this life-changing future. This boook offers profound insight into what happens (soon!) when intelligence flows as easily into objects as electricity. Much of what will happen in the next thirty years is inevitable, driven by technological trends that are already in motion. In this fascinating, provocative new book, Kevin Kelly provides an optimistic road map for the future, showing how the coming changes in our lives—from virtual reality in the home to an on-demand economy to artificial intelligence embedded in everything we manufacture—can be understood as the result of a few long-term, accelerating forces. Kelly both describes these deep trends—interacting, cognifying, flowing, screening, accessing, sharing, filtering, remixing, tracking, and questioning—and demonstrates how they overlap and are codependent on one another. These larger forces will completely revolutionize the way we buy, work, learn, and communicate with each other. By understanding and embracing them, says Kelly, it will be easier for us to remain on top of the coming wave of changes and to arrange our day-to-day relationships with technology in ways that bring forth maximum benefits. Kelly’s bright, hopeful book will be indispensable to anyone who seeks guidance on where their business, industry, or life is heading—what to invent, where to work, in what to invest, how to better reach customers, and what to begin to put into place—as this new world emerges.